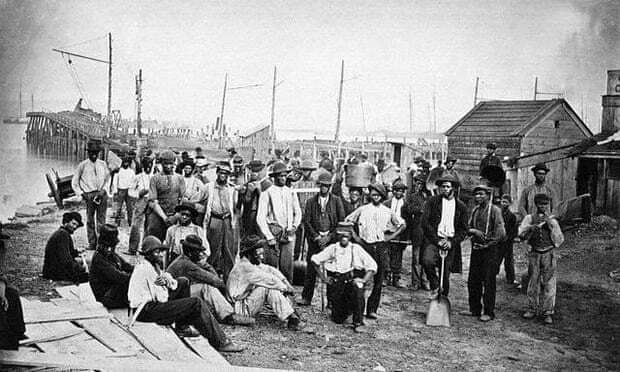 African American fugitive slaves provide support to the Union war effort, circa 1863. The records belong to the Freedmen’s Bureau, an administrative body created by Congress in 1865 to assist slaves in 15 states and the District of Columbia transition into free citizenship. Before that time, slaves were legally regarded as property in the US and their names were not officially documented. They often appeared only as dash marks – even on their owners’ records. African Americans trying to trace family history today regularly hit the research equivalent of a brick wall prior to 1870, when black people were included in the US census for the first time. Now a major project run by several organisations is beginning to digitise the 1.5 million handwritten records from the Freedmen’s Bureau, which feature more than four million names and are held by various federal bodies, for full online access. All the records are expected to be online by late 2016, to coincide with the opening of the new Smithsonian National Museum of African American History and Culture on the National Mall in Washington.